1. Extended Author Bio: Managing your EzineArticles account involves much more than writing and submitting articles. You need to complete your Extended Author Bio so your readers can review your background and accomplishments. Your Author Bio will serve a better purpose when you have a website listed. This is also the place where you can connect to all of your websites, blogs and social media profiles. 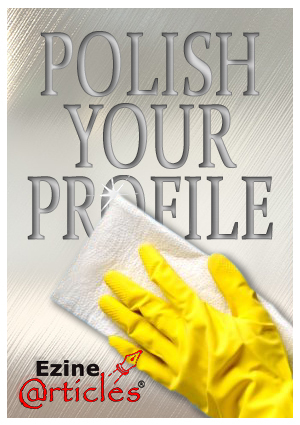 We recommend taking another look at your Extended Author Bio to get your profile up-to-date and looking professional. 2. Profile Picture: An important step in completing your Extended Author Bio and establishing a presence for your readers is uploading a profile picture. It’s important for your readers to see a face behind the name of the content they’re reading. Your profile picture gives them a sense of who you are and what you represent, while also adding to your credibility as an author. If you’re still questioning whether this is a good decision for you or not, click here for more information. 3. Alternate Author Names: Did you know you can manage multiple author profiles on the same account? If you often write in a variety of categories and would like to track your articles separately, consider adding Alternate Author Names to your account. You can use variations of your current author name, pen names, or other authors associated with your brand and/or company. Please read A Guide to Managing Alternate Author Names for more details on adding more author names to your account. 4. Article Performance: All of our members are able to track the performance of their articles. You are able to monitor your articles’ traffic and activity over time, compare your articles, and view any comments left by your readers – just to name a few. You can also see the category ranking of your articles and view a monthly summary. Visit the Performance tab on My.EzineArticles.com to see how well your articles are doing. 5. Saved Resource Boxes: One of the most popular features authors take advantage of on EzineArticles.com is the ability to save up to 3 unique Resource Boxes to use with their articles. When you have multiple author profiles on your account, each one can have up to 3 Resource Boxes! However, updating a Saved Resource Box on your account will not affect any of your live articles. Visit here to start creating your Resource Boxes to use with your articles. 6. Author and New Article Alerts: There are almost 500,000 Expert Authors on EzineArticles.com. Can you believe it?! At any time you can sign up for new article alerts from your favorite authors. Visit the author’s page and enter your email address in the Author Alerts section. You can also get the latest articles in your niche with new article alerts. Visit the EzineArticles Subscriptions page to select all the content categories that interest you. If you would like your readers to sign up on your website to receive alerts about your newly published articles, click here for more information on how to set this up. 7. EzineArticles Widgets: Another convenient tool to add to your website is our EzineArticles Widget. You can set it to automatically add your newly published articles, or to add new articles in any category of your choice. You can also show articles from a different Alternate Author Name on your account (or even authors not associated with your account). Visit this page to use the EzineArticles Widget for authors not associated with your account. 8. Update Your Links: Managing your websites is another significant part of your business. There are times when the pages on your links don’t work properly, or your domain name changes. If you already have live articles with these links, you are free to update these articles at any time. If your account is in good standing and you have an excessive amount of articles to update, contact our Member Support Team for assistance. We might be able to replace the Resource Box in these articles quickly so you don’t have to make any updates. 9. Don’t Forget to Network: We’ve made it easier than ever to network with other authors in the My.EzineArticles.com Expert Author community. Start building and expanding your network with our Recommendations section, which lists thousands of potential connections based on your profile and article content. Use the Discussions section to ask for advice, share your achievements or start conversations with other Expert Authors! Learn more about this here. What other tools or resources would you like to see in the future? Feel free to share your thoughts in the comment section below! Hi, first off all I need to say is thank you for posting this helpful article. Very useful information. This article makes me understand how I will succeed in this site. Great information, thank you. Keep learning everyday! Thank you Ezine for helping us writers and/or business people make our articles useful for the audience. Lovely little article and well illustrated. You’re right, there are many authors here who have been writing high quality articles with confidence for years. But sometimes good content isn’t enough. Creating a 5-star profile is what matters most in utilizing your EzineArticles account in the best way you can. I’m sure all these tips will be helpful in improving your author profile. Good luck to everyone with managing your account like an expert author! Although I’m new to EzineArticles, I have heard a lot about it. I would like to be engaged with EzineArticles for long. The above post is really helpful for people like me. Thanks for sharing. Hey, these tips of using EzineArticles like a pro are really helpful, new to it but I have heard a lot about it from my friends. Thank you for posting good stuff.